Click the button below to add the Infrared Shield for Raspberry Pi to your wish list. This shield addes the IR transceiver to Raspberry Pi. It requires user to solder the infrared LED D2, and disconnet the solder point SJ1. 5. Support XBMC. Users can use the infrared functions under XBMC. 6. 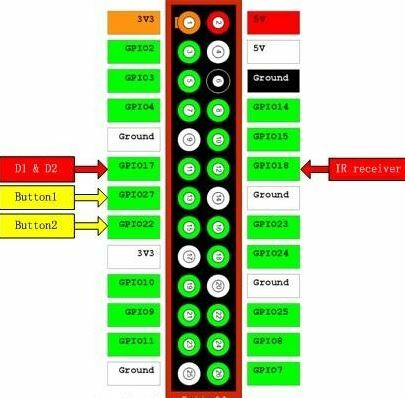 Support dual GPIO buttons, users can configure the functions of these two buttons. Straight-forward install to RPi A+ GPIO pins, just line up and press on. The shield includes a space for a second IR led and passthrough of some unused gpio pins. The CuteDigi tutorial and pinout were spot on. It does require the latest RPi firmware, upgrade it with rpi-upgrade if you encounter errors.